Q: Will my Voyager 510S work on my computer ? - Headsets Direct, Inc.
Q: Will my Voyager 510S work on my computer ? A: Yes. And since the Voyager 510 headset is Bluetooth, there are a few possibilities. The first option which is the most cost effective and easiest way is of course if you have a newer computer that has Bluetooth built in, then all you have to do is pair it up. Our 2nd option is that you can purchase a USB Bluetooth adapter such as the Plantronics BUA-100, this adapter will plug into a usb port on your computer and will pair up to your 510 headset. This is a nice clean solution because it is “plug, pair, and play”… And you won’t have to add another cable to the collection that you already have on your desk. Our 3rd option is to use our Headsets Direct PC/Phone headset switch (05344-42). Now this is a corded solution that will connect your 510S base to your computer and your telephone. 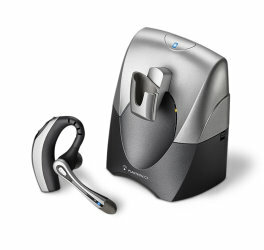 This will not be as seamless to use as a USB Bluetooth adapter, but the advantage to this option is that it will connect almost any of the Plantronics wireless and corded systems to your computer, and it will even let you use your regular telephone handset if you would. So check out the options on our website, and of course we are only a phone call away to answer any questions that you may have.